Well, the stakes just got notched up a bit higher. Some of the other letters in this set are bright, but this uppercase alphabet letter J has taken the cake. Bright pink paired with bright yellow just make you want to sing, or go on a picnic, or something equally as wonderful! 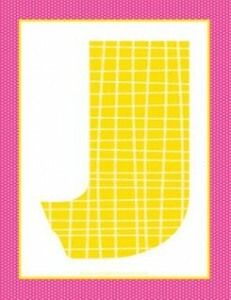 With the pink in the background, the bright yellow J stands out front and center, eagerly wanting to do it’s job of being a light for letter J.